London - A British toddler regularly embarrasses his mother by setting off stores' electronic alarms with his magnetic force field, the Daily Express newspaper has reported. Whenever Harry Fairweather, 2, visits a shop with his mother, Paula, he triggers the alarms which normally detect when someone is walking off with goods without paying, the report says. The only explanation doctors have come up with is that he exudes magnetic waves which are, picked up by the alarm sensors. His mother once stripped Harry to his underpants to prove to store detectives that he had not stolen anything, but the alarm still went off when they tried to leave. According to the report, staff at local shops are so used to the occurrence that they no longer challenge Harry. "We have been told by a top doctor that Harry has a very rare condition which means he has an electric force field around him," his mother told the newspaper. 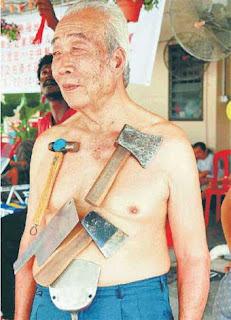 Kuala Lumpur - Liew Thow Lin is not a 70-year-old human magnet, as appears the case when he hangs heavy metal objects from his bare chest, but he does have exceptional skin, Malaysian scientists have found. Recent tests for magnetic and electrical fields around Liew, dubbed Mr Magnet by local media, who with various family members makes regular appearances in Malaysian newspaper pages looking like an impromptu hardware store display, proved negative. What caught Universiti Teknologi Malaysia (UTM) scientists' eyes instead was Liew's unusual skin, according to Wednesday's edition of The Star newspaper. "His skin has a special suction effect that can help metal stick to it," the paper quoted UTM professor Mohamed Amin Alias as saying. "That's why his 3 sons and 2 grandchildren also have the 'magnetic-like' ability. They have his genes," he said after examining Liew in Ipoh, capital of the northwestern Peninsular Malaysian state of Perak. The grandfather is reported to be able to carry 66 pounds attached via a chain to a metal plate against his chest. All electric currents generate electromagnetic radiation (or, more accurately, electric and magnetic fields). The electric field is proportional to the voltage (which can be considered as the "pressure" with which electricity is "pushed" through the wires). The magnetic field is proportional to the current, that is, to the amount of electricity flowing through the wires. The direction of the current, and therefore of the magnetic field, changes 50 times per second. Electric fields can be easily shielded, but the shielding of magnetic fields is technically difficult and therefore very expensive. Buried power lines generate lower magnetic fields than overhead power lines because of their design, not because the earth eliminates the field. The easiest way to reduce exposure to magnetic fields is to increase the distance from the source, particularly for fields generated by appliances. Power lines include transmission lines (mounted enlarge steel towers) and distribution lines (mounted on concrete or wood poles placed on the road reserve). Transmission lines generate both strong electric fields and strong magnetic fields. Distribution lines generate weak electric fields, but can generate strong magnetic fields, depending on the number of houses they supply. Human studies have consistently shown that there is no evidence that prolonged exposure to weak electric fields (such as those found in the home or in most work places), results in adverse health effects. Whether chronic exposure to weak magnetic fields is equally harmless remains an open question. There is no evidence that these fields cause immediate, permanent harm. However, laboratory studies on animals and cell cultures have shown that weak fields can have effects on several biological processes. For example, they may alter hormone and enzyme levels and the rate of movement of some chemicals through living tissue. By themselves, these changes do not appear to constitute a health hazard. We do not know if, in the long term, they may have an effect on the incidence of cancer or other adverse health effects. Only in a few studies have these fields resulted in an increased cancer incidence in laboratory animals. Several studies have reported that children, living in houses where a higher-than-average magnetic field was measured or calculated, had a higher cancer incidence than other children. Three studies have reported that children living near high current transmission and distribution lines had a higher cancer incidence than other children (high currents produce strong magnetic fields). One study has reported that adults living near high current transmission and distribution lines had a higher cancer incidence than other adults. The results of a few other studies also suggest an association, but with a large margin of uncertainty. A few additional studies produced inconclusive results, neither confirming nor disproving this association. Over thirty studies have reported that adults, working in occupations where a higher-than-average magnetic field was found or expected, had a higher incidence of some cancers (usually leukemia, brain tumours or breast cancers) than other adults. A few similar studies could not find this association. A few studies have tentatively suggested that pregnant women, who are exposed to higher-than-average magnetic fields, appear to have a higher than expected rate of adverse pregnancy outcomes. However, these statistical associations do not necessarily mean that a direct relationship exists between magnetic field exposure and cancer. The increased cancer risk may be due to some other, as yet unknown, factor. To date, there is no satisfactory theory to explain how magnetic field exposure could lead to an increase in the cancer rate. There are currently no Australian Standards regulating exposure to 50 Hz magnetic fields. The National Health and Medical Research Council has published Interim guidelines on limits of exposure to 50/60 Hz electric and magnetic fields. These guidelines specify magnetic field levels below which immediate health effects are unlikely. They are not intended to provide protection against possible cancer induction by continued exposure to lower levels. The widespread use of electricity means that in all work places, there will be levels of magnetic fields that would be considered "normal". However, there are also localized sources of magnetic fields in the work place such as electrical substations in the basement, power cables in the walls or floor and distribution lines close to the building. The field levels close to these sources will be relatively high and should be avoided. The only remedies currently available to reduce these fields, and the resultant exposure, is a combination of shielding and relocating the source (both very costly), and relocating the employees (also potentially costly). The general aim of any field reduction program is to both minimize and equalize the exposure level (and therefore the possible health risk) for all staff. However, particular situations may require particular solutions. Although the existing evidence is insufficient to justify drastic and expensive measures to reduce exposure, simple steps can often be taken to reduce exposure at little or no cost. Using an electric blanket to warm the bed and switching it off before climbing in will virtually eliminate what could be a significant exposure. Locating bedrooms towards the rear of the house reduces dramatically the exposure due to distribution lines in front of the house. Moving a bed away from an outside wall which has an electric hot water service on the other side will also reduce exposures. A distance of about 50 cm between a video screen and the user usually results in an exposure not very different from those found elsewhere in the environment. The overall pattern of results to date suggests that exposure to magnetic fields may increase slightly the risk of cancer. Exposure to magnetic fields at the levels commonly found in the environment is not a proven health risk. Moreover, the evidence does not allow health authorities to decide whether there is a specific magnetic field level above which chronic exposure is dangerous or compromises human health. At this stage, any action to reduce exposure must rest with the individual. Clifford Matthews says their home life began improving after wife Rosemarie had electroshock. Until last year, Rosemarie Matthews was the very picture of a grandmother, baking pies, playing bingo and occasionally pumping a few quarters into the slot machines. A social magnet for her 7 children and the swarm of grandchildren and great-grandchildren who filled her Windsor Locks home in Connecticut on weekends and holidays, Matthews never seemed to run out of loving energy. But hidden within the confines of her kitchen, the storybook grandmother was spiraling into depression, masked by the cocktails she kept mixing to boost her spirits. By the time she hit the bottom of her emotional abyss, she was wasting away in a nursing home, unable to eat or sleep, her personality so distorted that she had alienated most of her nurses. In the end, it took a treatment Matthews once associated with Frankenstein's monster to bring her home. "I asked the doctor at the nursing home; I said we gotta do something for her," recalled Matthews' husband, Clifford, who by last summer feared his wife was dying. "They said we can put a tube in her stomach or give her electrical shock treatments." Shock treatment. The very name conjures up images of psychiatry's sometimes-regrettable past. But the treatment that has become almost synonymous with Jack Nicholson's body convulsing barbarously in the movie One Flew Over the Cuckoo's Nest remains one of the quickest and most effective depression remedies in psychiatry's toolbox. "Again and again people say, 'I thought they didn't do that anymore,'" said Dr Robert Ostroff, director of the Electroconvulsive Therapy Center at Yale-New Haven (Connecticut) Hospital. But since the 1930s, when two Italian mental health practitioners discovered a safe way to produce brain seizures using electrical shocks, psychiatrists and researchers have continued to refine and improve the technique. Since the 1980s, when medications in the Prozac family showed that altering brain chemistry can help people devastated by depression, electroconvulsive therapy has gained a stronger foothold in the psychiatric arsenal. While anti-depressants work well for some people, they provide no benefit to as many as 1/3 of the patients who try them. Even when drugs work, they can take weeks to kick in - too long for people whose despair is stirring suicidal feelings. "Every article (that criticises shock treatment) fails to convey how sick these people really are," Ostroff said. The idea that seizures can help calibrate brain chemistry can be traced back to the asylums of the early 20th century, where clinicians noticed that people who had multiple epileptic seizures showed improvement in their symptoms of depression. Shocking the brain with electric currents similar to those used to illuminate a light bulb became a safer alternative to medications such as insulin or camphor, which made patients horribly sick at the same time that they induced a seizure. In almost 70 years, the idea behind shock therapy has not changed. The method of delivery has. Rosemarie Matthews had her first shock treatment at the University of Connecticut Health Center in the summer. Instead of being delivered in one gigantic jolt, gentler shock treatments are now given 2 to 3 times a week until the patient has completed 8 to 14 sessions. Matthews knows she has had some memory loss, which electroshock foes cite as its most devastating side effect. The treatment is done under general anesthæsia, so it was natural that Matthews didn't remember the first shock. Patients also are given a muscle relaxant to spare them the discomfort of violent spasms that often accompany a grand mal seizure. Matthews is confused about the events leading up to her treatment. But while some shock opponents say the therapy robs patients of their pasts, Matthews says she has not lost track of her life before she became depressed. Doctors acknowledge that electroconvulsive therapy, as it is called today, has risks, not the least of which are the possible complications from general anesthæsia. They also agree that some patients suffer more extensive memory loss than others. That is why researchers are looking for alternatives. At Columbia University in New York and several other large medical centers, researchers are trying to find out whether magnets placed strategically on the brain can stimulate enough electrical activity to balance the chemistry without causing a seizure. If multi-center clinical trials show positive results, the technique, transcranial magnetic stimulation, could be ready for review by the FDA, said Sarah Hollingsworth Lisanby, director of the magnetic stimulation lab at Columbia. If approved, she said, magnetic brain stimulation, which does not produce seizures and does not require anesthæsia, could be a step patients could try before convulsive therapy. Lisanby also is looking at the potential for using magnets to produce seizures that are targeted to a small area of the brain, away from the temporal lobe, which is responsible for memory. "If magnetic therapy is successful," Lisanby said, "it could be the next phase of convulsive therapy." One reason for continued interest in convulsive therapy is pressure from insurers to treat psychiatric patients quickly, said Dr Michael Henry, electroconvulsive therapy chief at McLean Hospital, a private hospital near Boston. It is affiliated with Harvard. In addition to the initial intensive dose, patients who do not respond to medications may also return to the hospital once a month or so for what are known as maintenance shock treatments. Shock is also especially effective for elderly patients, such as Matthews, who cannot tolerate the side effects of medication. Such side effects can include blood pressure changes, said Joanna Fogg-Waberski, director of geriatric psychiatry and electroconvulsive therapy at The Institute of Living in Hartford, Connexticut. The main criteria for considering shock treatment is major depression with psychotic symptoms such as hallucinations, refusing to eat, not getting out of bed or inability to sleep, she said. "But," Fogg-Waberski added, "there are people in the middle who do not respond to anti-depressants or have terrible side effects" who might also benefit from shock. Matthews went home from the nursing home three weeks ago and is continuing shock therapy as an outpatient. She is cooking again and has already joined her husband on a trip to the casino. What if, seconds before your laptop began stalling, you could feel the hard drive spin up under the load? Or you could tell if an electrical cord was live before you touched it? For the few people who have rare earth magnets implanted in their fingers, these are among the reported effects - a finger that feels electromagnetic fields along with the normal sense of touch. It’s been described as a buzzing sensation, a tingling, an oscillation, movement, pure stimulation and, in the case of body-modification expert Shannon Larrett’s encounter with a too-powerful antitheft gateway at a retail store, "Like sticking your hand in an ultrasonic cleaner." Body-mod artists Jesse Jarrell and Steve Haworth’s original idea was to implant a magnet to carry metal gadgets. It turns out that doesn’t work: If you try to carry something magnetic on your implant regularly, the pinched skin between the magnets dies and your body rejects the implant. But they came up with a new application when a mutual friend suffered an accident that left a shard of iron in his finger. He worked with audio equipment, and found that he could tell which speakers were magnetized from the sensation that passed through his finger at close range. That gave Jarrell and Haworth a new direction: Could they obtain that effect deliberately, extending the sense of touch into a sense of magnetism? Todd Huffman, a graduate student at Arizona State University with a background in neuroscience, joined the project and brainstormed with Jarrell and Haworth about how, and where, to best implant a powerful magnet. He helped come up with the most effective design for an implant, and eventually became the first recipient. "The fingertip was chosen because of the high nerve density, and because the hands are constantly interacting with the environment, increasing the chances of sensing electromagnetism in the world," Huffman says. "We chose the ring finger primarily because of its size and relatively low importance in gripping action, so there was plenty of room for the implant and a lower chance of physically damaging the implant," Huffman explains. Jarrell puts it more bluntly, writing about the procedure in a BMEZine article from March: "’If you had to lose or seriously damage one of your fingers, which would it be?’ This was our answer." But nobody’s finger fell off, and Huffman’s results were better than they’d imagined. I took a trip to Phoenix to have Haworth implant a magnet in me last September. Because body-mod artists are not medical practitioners, ice was the only ænesthetic available. My finger was soaked in ice water until it began to hurt. After that, Haworth acted quickly to get as much of the implant done as possible while my hand was still numb from the cold. The initial cut did hurt, but not unbearably. He sliced open my finger with a standard scalpel, inserted a tool to make a gap for the magnet, and tried to insert the magnet in one nonstop motion. The insertion didn’t work, and he widened the cut and tried again. This time it worked, and he closed the cut with a single suture. The suture was the most painful step - an indicator that the cold "ænesthetic" had worn off. The process took less than 10 minutes. My finger was slightly swollen and sported a blue, knotted plastic thread. When we were done we sat in Haworth’s living room. He brought out a magnet and handed it to me. I brought it near my finger and felt the magnet move for the first time up against the raw inside of my finger. I startled visibly, and Haworth grinned. "Welcome to your new sense," he said. At first there was no discerning between the throbbing of the injury and the sense of magnetic fields. Consequently, some early encounters with industrial refrigerators remain mysterious - was the display case at Citizen Cake really giving off that much EM, or was I just having blood rush to my healing finger? Other sensations were unmistakable from the start. I would circle my finger with a strong magnet and feel the one in my finger spin. In time, bits of my laptop became familiar as tingles and buzzes. Every so often I would pass near something and get an unexpected vibration. Live phone pairs on the sides of houses sometimes startled me. I become slightly phobic of magnetic resonance imaging machines. The superpowerful electromagnets used in medical imaging can make metal fly across a room and stick, often for the hours it takes to power down the magnets. A person with an embedded magnet runs the risk of having their implant ripped out of their body. People with magnetic implants can’t erase hard drives or credit cards. They don’t set off airport metal detectors or get stuck to refrigerators. The magnets are small, and once encased in skin, all they do is react next to nerves, conveying the presence of sufficiently strong electromagnetic fields. "The magnetic implant is not the most sophisticated or rich sensation, it was just the easiest to implement with our available technology," says Huffman. Implant work isn’t ready for prime time. While Huffman loves his implant, he discourages others from getting it. "Most people don’t understand the risks, and implant work isn’t appropriate for most people." Those risks include infection and breach of the magnet’s silicone sheath. The procedure itself is painful, and the results vary from person to person for unknown and unstudied reasons. Huffman doesn’t see it as a candidate for study. "The science of sensation is something very much studied by neuroscientists and psychologists, but no one has done what we did," Huffman says. "The regulation would be onerous, even if someone wanted to." Zack Lynch, managing director of neurotechnology consulting firm NeuroInsights, is skeptical of the practice altogether. "I’m not sure if it’s efficacious, intelligent or therapeutic; I’d worry about long-term problems, including corrosion." Several months after having the procedure, some people begin to have problems. Some magnets begin to turn dark under the skin, suggesting the bio-neutral silicone sheath is failing. Exposure to the body starts breaking down the magnets. Two months after my own magnet was inserted, and long after the cut itself had healed, I experienced one of these problems firsthand. My shielding breached and the implant area became infected. The infection resolved, but the region turned black and my sixth sense evaporated. My family doctor tried to remove the magnet and failed. Instead, the implant shattered into pieces, and I could no longer pick up other magnets with my finger. After months of ESP, all I had left was a sore digit with a dark spot. I figured that was the end, but it wasn’t. Four months after I lost all effect, the spot darkened and the magnetism returned. The magnet - being a magnet - had reassembled itself in my finger. While it’s nowhere near as sensitive as it once was, I can once again pick up other magnets. Haworth plans to try a new generation of magnets with a 70-durometer liquid silicone rubber coating, up from the previous 30 to 40 durometers. That’s going from the hardness of a pencil eraser to the hardness of a car tire. No one knows if that will do the trick, but in the body-modification community, there’s only one way to find out.